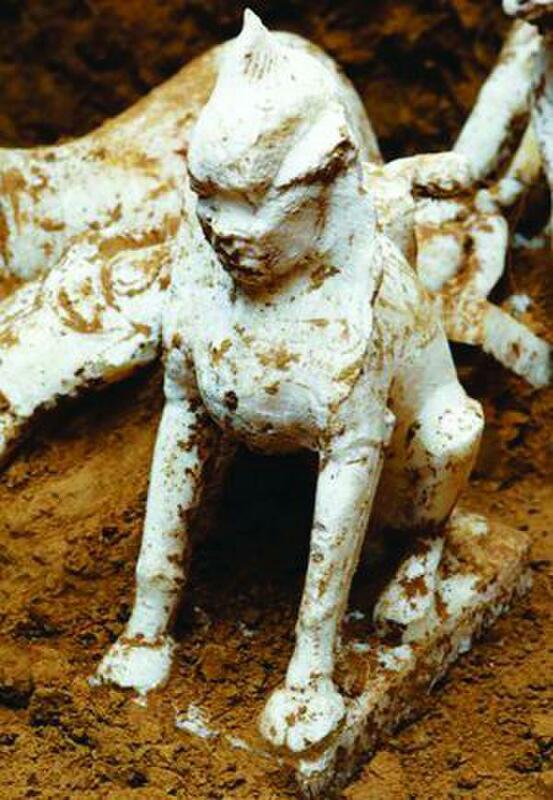 During an excavation in Guyuan City, Ningxi Hui Autonomous Region, northwest China, archaeologists have unearthed a sphinx made of white marble in a tomb dating back to the Tang Dynasty, more than 1000 years ago. The burial chamber where the strange relic was found is located on the side of what was the ancient Silk Road, a network of trade routes that connected Asia with cultures of the Middle East and the West. According to reports from Xinhuanet, the tomb is found among 29 ancient funerary structures excavated by archaeologists this year, ahead of a forthcoming construction of a local water plant in the region. So far, experts have discovered more than 150 items, among them nine marble statues and pottery utensils, made of bronze and iron. Marble sculptures including the Sphinx denote a foreign origin, that is, it came from another part of the world and is not native to China. According to preliminary reports, the delicately-carved sphinx statue is 36 cm high with 21 cm long and 13 cm wide base. The Sphinx is composed out of a human face with a bulge on the head and a sitting lion body. Researchers report that the sphinx statue, which is made of white marble was found nearly intact expect for a minor damage found in the middle of the face of the sphinx. “The style carvings had features from the west and are considered rare for ancient Chinese tombs during that period,” said Fan. The white marble material was also rarely seen in north China, he added. The excavations will help scientists better understand freight transport during the Tang Dynasty, said Fan. According to an epitaph, the tomb belonged to Liu Jun and his wife, who lived during the Tang Dynasty (A.D. 618-907). According to Historians, it is very likely that the mysterious Sphinx came from the west through the Silk Road as an ancient rarity, a valuable treasure of the past and was buried next to its past owners. It is clear that the Sphinx was a very important symbol of the past as similar statues have been discovered in Europe and Africa. The original ‘Great Sphinx’, and the best example can be found in Giza. The Great Sphinx of Giza has been the subject of debate recently after two scientists proposed that this majestic monument is around 800,000 years old.